"I think we're all quite mad. Some of us are just more discreet about it." This book was the first I read after coming back from Florida, and I couldn't have asked for a better read. 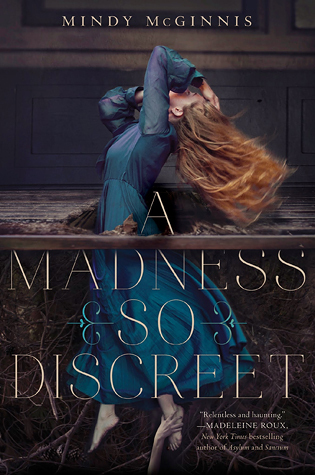 I've always been interested in asylums and the accuracy of the word "madness", so as soon as I saw the book I knew I was going to read it. A month or so after this book first came across my radar, it was pointed out to me that there's a hand at the bottom of the cover holding onto the girl's foot and I was literally like omg that's so freaking cool. Once I finally got the chance to start reading the novel, it didn't disappoint: the mystery, setting, writing, and characters are splendidly written, and I didn't stop reading until I was finished. The beginning of the novel is shocking in its vibrancy, and the rest of the book follows the same, brilliant path. As soon as you start reading you're hit with shock and concern and avid interest - this book will hook you. As you start to learn more about the main character Grace, you move from confusion to anger about her position to so many other emotions that you can't even sort them all out. Readers are quick to empathize with the girl, and her point of view is thrilling. She goes from fiercely protective to a lost girl, then to a young women finding her place. This, accompanied with the deeply intriguing "historical thriller" part of the novel make this a book you need on your shelf. On another note, I found it kind of ironic that there were people throughout the book warning Grace not to be pulled into the doctor's darkness. They kept suggesting that the doctor had dark secrets about him and that they didn't want Grace to get so caught up in solving the mystery that she let her light become extinguished. The funny thing is, I thought the doctor was the better person in the crime-solving duo. He always seemed to do the right thing, and oftentimes it was him holding Grace back from doing something she may or may not end up regretting. The doctor was compassionate to all his patients, and he seemed a rather fetching fellow. And he had strict morals, while for Grace, they were a bit blurred. If anything, people should have been cautioning the doctor, but maybe that's just me. I may have already mentioned this, but the mystery was really well done. It was by no means a simple case, and the little details made it all really come together. I also appreciate how the author went into Grace's own story and recounted to readers the horror that is her past - it clears up things about Grace and helps us understand her more, if not completely. Both the doctor and Grace both have an air of mystery about them, and it was great wading through their characters while also figuring out the mystery. It's hard to think of a way this book could have been better. Oh wait, there is one thing, now that I think about it. The end. It wasn't enough; I was left wanting more, but not in that good way that means the author has done her job. I loved how Grace solved the mystery - and also the doctor's reaction to that because Y E S more signs pointing to a possible romance - but there was just something missing. Maybe I wish the climax was a bit more climax-y, or maybe that the big finale wasn't skimmed over? Either way, I didn't get to see justice (if you can call that) really get played out, and it just slightly bothers me. It didn't detract from the story too much though. I'd be okay with it if only there was a sequel. So yes, you can trust me when I tell you that if you read YA or enjoy the Historical genre, then please do yourself a favor and add this book to your TBR. You won't regret it. Book Synopsis: Grace Mae knows madness. Source: A copy was received by the publisher for review.